Architectural grade rotationally molded designer polymer resin. Californian Planters are UV protected from sun light. Excellent Freeze/Thaw Characteristics. Strength and Beauty, interior or exterior, Armeria Californian containers can handle the most inclement weather conditions. Landscape architects, interior designers, contract landscapers, and interiorscapers have the capability to put the classic look of aesthetically appealing planters on rooftop decks, balconies, and other spots where weight is a consideration. 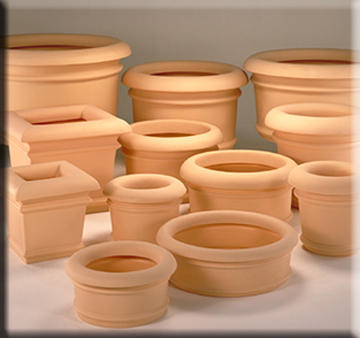 TerraCast polymer resin planters are manufactured in the United States ensuring prompt delivery and good quality. Rotationally molded barrel vase planters represent a viable lightweight alternative to traditional planters of clay, concrete or aggregate materials. 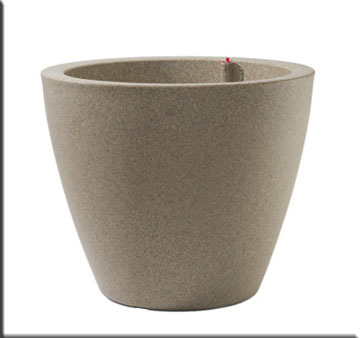 Californian Plastic planters are up to 50% lighter than terracotta or concrete planters. These architectural quality planters have an extra thick walls. Formerly Rotonics Manufacturing Inc. planters. A majority of Armeria's TerraCast planters boast recycled material content. Percentages increase with the darkness of color. Black planters can be manufactured from 100% recycled material. Terracotta colored planters can contain up to 20% recycled material. Products can also be recycled after use. Part # Ref. # Dia. Wt.